A one bedroom wooden cabin set in its own garden situated within the grounds of historic Burton Hall. The Cabin enjoys stunning views across the old town of North Tawton to Dartmoor. There is an open plan living room with comfortable corner settee and a flat screen television and DVD player. There is a wood burning stove (initial basket of logs included) for those chilly evenings as well as gas central heating.The well equipped kitchen has a dining table overlooking the garden. The comfortable double bedroom is off the living room with plenty of storage space. Outside there is a seating area where you can enjoy alfresco meals with a BBQ for sunny days. This is an ideal place for getting away from it all and enjoy the peaceful setting at one with nature. There are lovely walks on the doorstep and plenty of gardens and National Trust properties to enjoy close by. The East Wing apartment within Burton Hall enables couples or families to travel together and rent both properties. 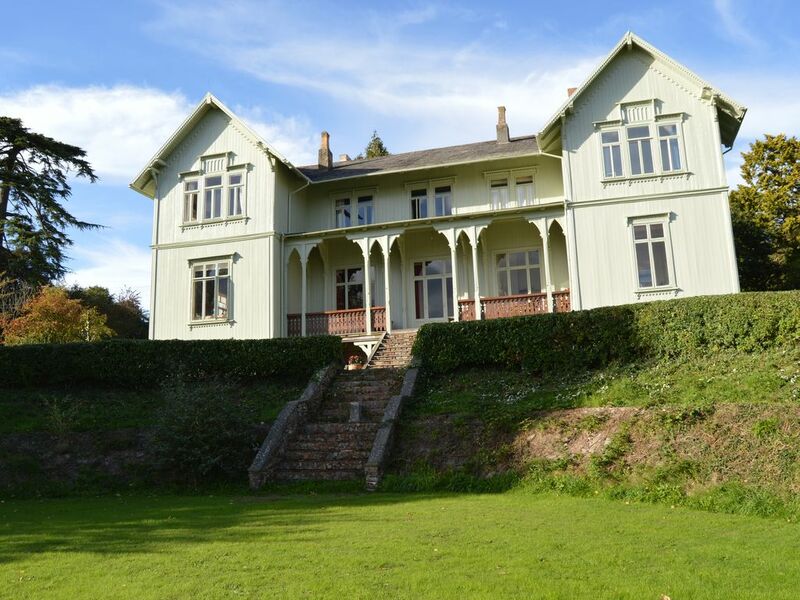 Burton Hall is a large attractive wooden house transported from Norway in the 1870’s by a local Wool Mill owner. It is set in 1.4 acres of garden with lovely views over the town and to Dartmoor. Having started life as a family home, Burton Hall went on to be a successful hotel, then a country club and now back to being a family home. We have 2 properties available for short breaks, weekend and longer stays - a one bedroom wooden Cabin and a one bedroom self contained Apartment situated in the East Wing of Burton Hall. Both have garden areas and are well equipped to ensure you have a comfortable stay. Views from the Cabin and the East Wing are stunning across the old town to Dartmoor. Surrounded by fields with far reaching views to Dartmoor, the Cabin and Apartment offer peaceful ‘away from it all’ experience attracting a wide variety of birds, bees and butterflies. This location is perfect for cycling and walking, with several walks on the doorstep, including the Tarka trail. A short walk down the hill brings you into the old town of North Tawton where you will find everyday amenities including a Spar, post office, chemist, deli/tea room, gift shop, three pubs with food menus and an award winning fish and chip shop. The market towns of Okehampton, Crediton and Hatherleigh are within easy reach where there are supermarkets, independent shops, open air markets and leisure centres. The lovely cathedral city of Exeter is 20 miles away. Burton Hall is ideally situated between the craggy tors of Dartmoor and the beautiful sandy beaches and surf of the North Devon & Cornwall coast with many delightful little villages dotted throughout the area. There are several excellent coarse fishing lakes and rivers, golf courses, and a number of National Trust properties and gardens, including RHS Rosemoor, within easy reach. There are few better spots from which to experience the joys of beautiful Devon. Martin and I moved to Burton Hall in 2013 after living in Bristol for over 30 years. When we retired we wanted to move to a rural area and have a project - we have done both of those things at Burton Hall! We both like walking and have discovered lots of local walks. We enjoy feeding and watching the birds in our garden, and relish the peace and quiet of the countryside. We were looking for a suitable property in Devon which would provide accommodation for ourselves and potential for developing holiday lets. Burton Hall offered us a unique project and scope to have 2 self catering units - the Cabin and the ground floor Apartment Burton Hall and The Cabin are in a lovely setting with stunning views across the old town to Dartmoor. Whilst enjoying a peaceful rural setting it is only 5 minutes walk down the hill to shops and local amenities in the small town of North Tawton. We enjoy the peace and quiet of the location and ease of access to local walks on our doorstep. Dartmoor and Fingle woods are only a short drive away. We enjoy visiting the market towns of Hatherleigh, Okehampton, Crediton and Tavistock. Whilst enjoying stunning views across to Dartmoor in a peaceful setting, Burton Hall is only a 5 minute walk from the small town. Cabin & Ground Floor Apartment offers scope for families or friends to rent together There are several local walks and cycle routes on our doorstep. The Tors of Dartmoor are easily accessed via Okehampton, Belstone, Chagford and Sticklepath, a short drive away. Being based in Mid Devon enables you to reach the North Devon and Cornwall coast, South Devon and the city of Exeter. In the lounge area there is a comfortable corner settee, coffee table, flat screen Freeview TV, DVD player and wood burning stove. Wi Fi is available as well as a selection of books, DVDs, games and information about the local area. There are 3 steps into the garden. In the Cabin there is a step down into the bedroom. There is a grab rail in the shower. Pleased you enjoyed your stay. Shame the weather wasn't better! You must come again in the summer. We enjoyed a 4 night break just after Christmas and it was a really enjoyable stay and a good base to explore the rest of Devon. The cabin is very spacious and has everything you need along with a welcoming plate of scones with jam and cream so a very pleasant surprise. Would definitely recommend staying here in this lovely cabin with great hosts and a perfect location. Thanks for your very positive comments, pleased that you enjoyed your stay in the Cabin. Hope to see you again. Loved the cabin,loved that you had your own private garden in beautiful setting. Thanks for your review. Pleased that you were able to enjoy the lovely sunshine in the garden. Perfect base for nipping around mid Devon! Perfect spot for what we needed. The whole process was so simple. And the scones with jam and cream on arrival were a lovely touch, thank you. Pleased that you enjoyed your stay in the Cabin and found it a convenient base to explore Devon. Thanks for leaving everything clean and tidy. Lovely peaceful cottage. Had lambs, squirrel, fox and rabbit just outside the window. Friendly hosts and historic building with a varied past. Thank you for your positive review. Pleased you enjoyed your stay and the wildlife nearby! I hope you enjoy the rest of your time in the UK. The Cabin is lovely & very peaceful in a super setting, it was very clean & everything was very nicely presented. Can't wait to stay again. Thanks for your positive comments, always very welcome! Pleased you enjoyed your weekend and had some nice weather. We look forward to seeing you again. Train and Coach stations in Exeter 20 miles away. Bus route from Exeter to North Tawton. Local shops in North Tawton; Supermarkets, Banks and independent shops in Okehampton, Crediton and Tavistock.